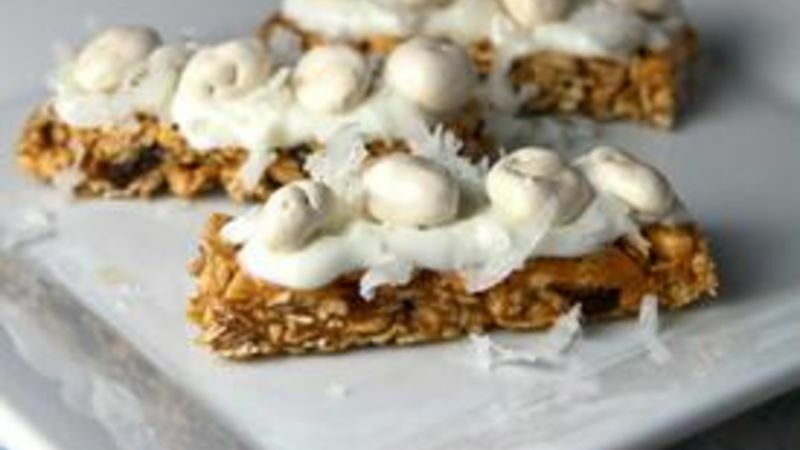 Open granola bars and place on a plate. Use a spoon to carefully spread Greek Yogurt over the top of each granola bar. Sprinkle with shredded coconut and top with yogurt-covered raisins for the snowy ants on your log! Ready to get your after-school snack on? Here are a few easy ideas that are sure to make that after-school rush easier than ever! When it comes to afterschool hours, they can be blissfully chaotic at my house. Wait?! What?!!! At your house, too? Well, praise and glory! I thought I was the only one! Here are a few ideas I've discovered to calm the storm that seems to envelop our home every time my kids come rushing through the door after school. To keep the kitchen clean, to help control portions, and to serve up the little people in my life with proper nutrition, I like laying out an after-school snack before they get home from school. That way, when they walk through the door, they not only have something to eat (something I approve of!) but they also are encouraged to sit down and enjoy a few minutes of chat time with their mama. Not a bad deal, eh? Placing after-school snacks on colorful plates, or serving them with fun party napkins lend a bit of cheeriness to the post-school frump time. Try serving fruit with colorful mini cocktail forks, or cereal with giant bowls and spoons for some added whimsy. This is a great idea if they're not snacking at home too -- say at an after-school activity or sports. Be fun! After-school snacks shouldn't require a hour of prep time. Grab a bowl of cereal with soy milk, serve up some homemade trail mix or Chex Mix and a handful of nuts, or try our fun twist on Ants on a Log with these granola-bar-based Snowy Ants on a Log. Fun, snappy, totally after-school cool! Ready to get your snack on? Here's how to make this fun recipe…. A box of Cascadian Farms Oatmeal-Raisin Granola Bars. That'll start you off on the right foot! Open up as many bars as you need, then place them on a cool plate. Spread about a tablespoon of yogurt on top of your granola bars. Sprinkle a bit of coconut. Not too much. And if your kiddos don't like coconut, try a bit of crushed Frosted Cinnamon Toast Crunch, instead! Now place a few yogurt-covered raisins right on top. Or let the kids do it. How fun and easy is this snack? Good enough to bite and munch, I think. Take a chomp and celebrate!